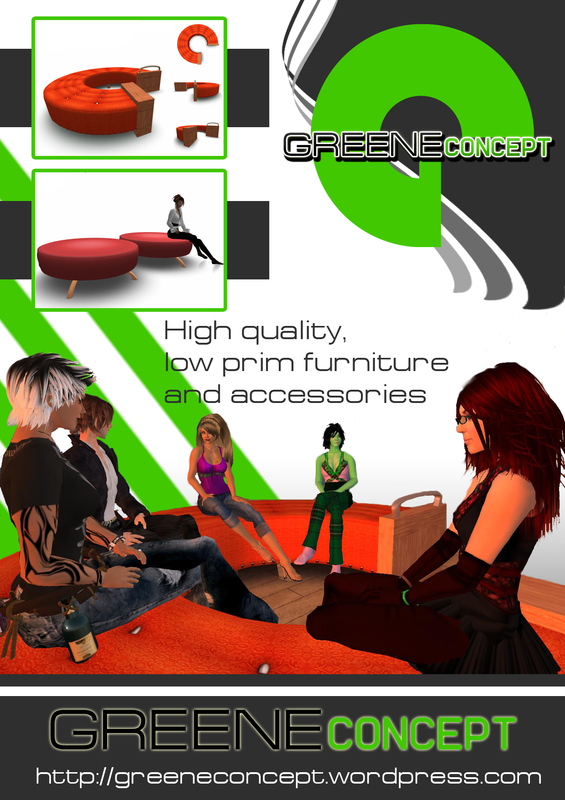 GREENE concept is pleased to announce the availability of the “fat packs” of their “Berlin” and “San Jose” furniture ranges. 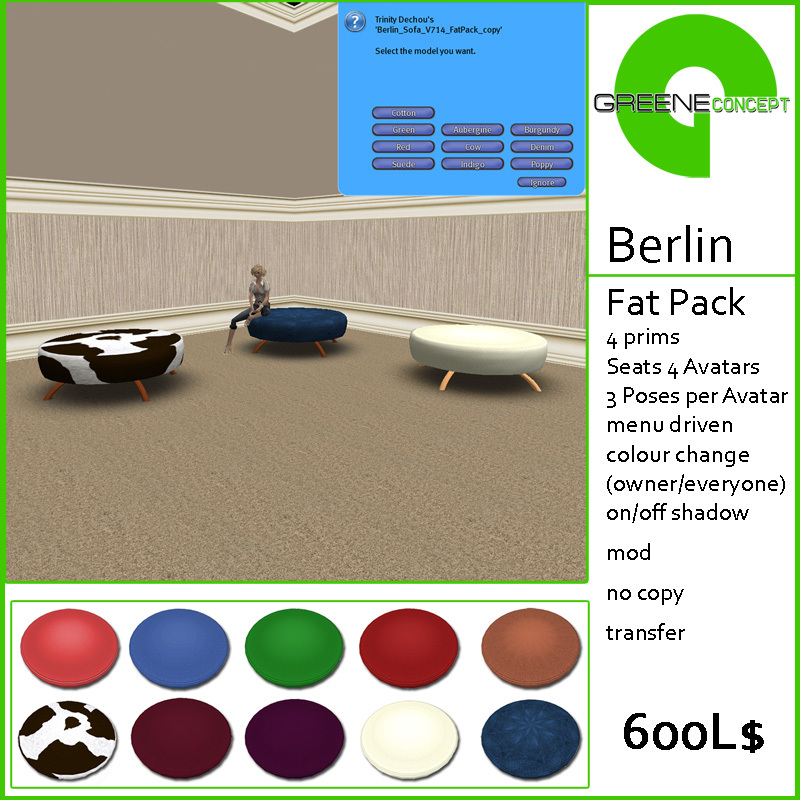 The fat packs include a menu that allows the owner (or everybody) to change between 12 (San Jose) or 10 (Berlin) designs. The “San Jose” is a horseshoe shaped upholstered bench which seats up to 5 avatars. The “Berlin” chairs seat up to 4 avatars. Both are ideal for informal meetings or get togethers on lounges, offices, clubs or shops – but also does well in private homes. Lightweight with only 7 prims in case of the San Jose or 4 prims in case of the Berlin’s, they randomly assign high quality sittings animations to their users. The textures are highly detailed hand drawn patterns. I was building a toaster the other day. It was composed of about nine prims, all providing various functions. I decided to make the whole thing physical, just to see how it would rest on a table. It rested a little bit above the surface because some of the prims had a 50% path cut. Something distracted me for a bit, I don’t remember what, and when I got back to the toaster I had forgotten that I had made it physical. I decided I wanted to change how it was linked to change the actual link numbers. When I unlinked the toaster, it flew apart with such velocity that some of the pieces were not contained by the room I was in and I had to go looking about for them. Thank goodness for ‘Select only My Objects’. Linden Lab’s plan is to have Mono running on all servers on July 23rd. That’s coming up soon. I took some time to go to the preview grid and rezzed the San Jose fatpack in a region running the Mono server code. Sandbox Wanderton for the curious. I went through all the scripts in the SJ recompiling them into Mono. I really wasn’t expecting any problems and everything went smoothly without any hiccups. The July 23rd target date is just that; a target. Until Mono is actually running on all main grid servers, all of our product development will include Mono testing. We found a bug in the San Jose fatpacks. The texture change script would get stuck if you clicked the San Jose and either clicked ignore in the dialog box or did something else to make the dialog box go away without making a choice. This was happening because there is no way, currently, to detect if the ignore button is clicked. Essentially, it would be forever listening for an answer that would never come. The way to fix it would have been to reset all the scripts in the San Jose, or to take/delete it and re-rez it. I put a timer in the state that handles the dialog box and listen event. If the listen event is not triggered during the timer’s duration, the script is set back to the default state, which also turns off the timer (timer events persist across state changes). This bug was found shortly after getting them to the shop floor, but we only had to issue the update to one person who had purchased the fatpack with the bug. Ike DeCuir, the graphic designer who created our logo, finished a graphical banner and an advertising for the Print Perfect magazine. He took up the visual ideas of the logo, and wove them cleverly with the outstanding product photography of Seikatsu Koba. The banner will appear on our OnRez and SLX storefronts, as well as in-world in our shop. I have completed the San Jose fatpacks. These are all twelve, menu selectable colors in one San Jose. They are available in both a no-copy/transfer version, at L$800, and copy/no-transfer version, at L$1000. This is a good value. Especially in the copy/no-transfer version. A sim owner can place a rainbow of seating for forty avatars, coming in at only 56 prims. It was Peter’s wonderful idea to have the San Jose fatpack ask the owner, upon rezzing, if they want everyone to be able to change the color, or just themselves. As usual, the owner can also disable the shadow plane prim if they wish by touching the handle. I could not believe my eyes, when I checked the recent sales statistics, and saw that Whump Linden has bought two pieces of furniture from us. Whump works as a web developer with Linden Lab and is about to furnish an in-world office for himself. He found GREENE concept via the “History of a virtual couch” article on New World Notes, and chose a Berlin with Holstein/cowhide design and a San Jose bench in anthracite. 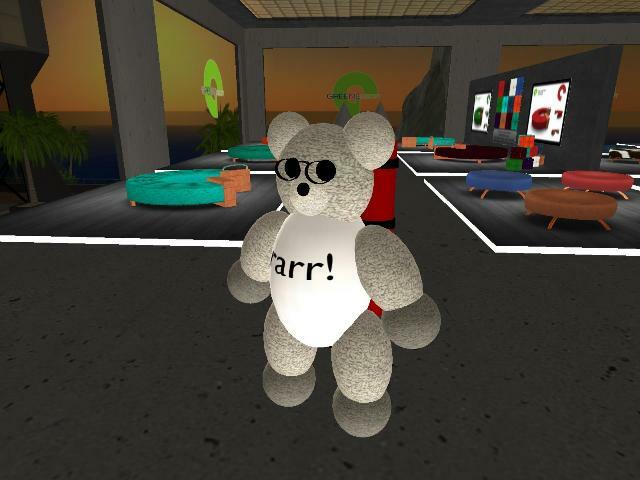 As some of you might know, every Linden is supposed to have a selfmade pet teddybear they hand out to residents for special achievements, favours or when they feel like it. Whump Linden has a rather nice bear with fireworks strapped to his back. The bear utters some funny lines when clicked. The photo shows the bear visiting the new GREENE concept shopfloor. Read more on Linden Bears in Voodoo Buwan’s article over at REZ magazine.